New hurricane record – 2232 days and counting since major Hurricane made landfall on the USA – last record was year 1900 | Watts Up With That? While the alarmists squall over trying to control what they perceive as “extreme weather” driven by global warming at Durban COP17, urging immediate action in the form of coughing up 100 billion a year to poor countries for “reparations”, a quiet record has gone almost unnoticed. As of midnight Sunday, it has been 2232 days since a major hurricane (CAT3 or greater) made landfall on the USA.Irene this year (Cat 1) doesn’t count, and I have doubts it was even a Cat1 hurricane at all given the low wind speeds when it made landfall. And that record can only get bigger, since hurricane season ended on December 1st. It won’t start again until June 1st, 2012, so at the very least we are likely to see 6 months (184 days including end date) added to this record for a total of 2416 days. It will probably be higher than that since historically we get few landfalling hurricanes early in the season. On December 4, 2011 it will have been 2,232 days since Hurricane Wilma made landfall along the Gulf coast as a category 3 storm back in 2005. That number of days will break the existing record of days between major US hurricane landfalls, which previously was between 8 Sept 1900 (the great Galveston Hurricane) and 19 Oct 1906. Since there won’t be any intense hurricanes before next summer, the record will be shattered, with the days between intense hurricane landfalls likely to exceed 2,500 days. If you are in the insurance or reinsurance business and want to stir up a little constructive mischief, you should ask your favorite catastrophe modeling firm or ratings agency to show you the mathematics behind their estimate of the probability of zero intense hurricane landfalls from 2006 to present (both made at the time and what they’d say today). (Hint: Zero. Zip. Nada.). This remarkable streak has to end sometime, and likely won’t be repeated anytime soon. One more thing. Clearly the claims of Al Gore and his ilk about Hurricane Katrina and other unfounded “AGW hurricane intensification” fears have been proven false. Not only that, deaths attributable to hurricanes are down too. That’s an inconvenient truth for Al Gore, but we’re the ones who are “racist” for saying such things. 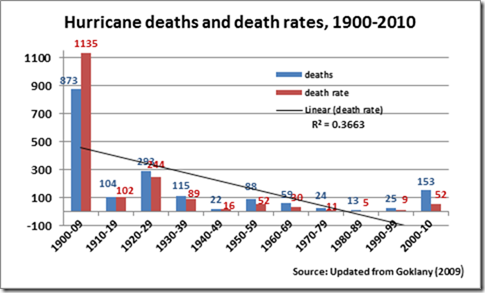 U.S. hurricane deaths and death rates per year, 1900–2010. Sources: Updated from Goklany (2009), using USBC (2011) and NWS (2011). For 2005, this figure uses National Hurricane Center data from Blake et al. (2007), which has 1,525 deaths for that year, but Blake et al. (2011) has 1,225 deaths while NWS Weather Fatalities uses 1,016 deaths. This figure uses the Blake et al.’s older data, pending consultation with Dr. Blake. December 5, 2011 in Al Gore, Alarmism, hurricanes. Ya know, I see a correlation with hurricanes and Al Gore’s minions talking it up. They have been quite silent lately….as has the hurricanes. Now that’s a two pointer. Correlation AND causation. So this means that Al Gore, James Hansen, ET AL are either liars or totally incompetent. Either way they need to be gone ASAP and then forgotten even quicker. To be strictly accurate, the word “mainland” should be inserted before “USA,” because the NHC doesn’t count landfall on the outer banks as landfall on the USA. 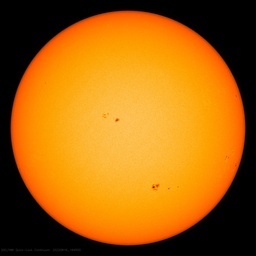 Are there any AGW folks out there who want to challenge these little facts? or perhaps explain why things are as they are? I’m sure Anthony will give you space if you have something sensible to say. The engineer in me certainly wants to hear any plausible AGW explanation because surely there is at least one AGW scientist, just one, out of the thousands who made up the consensus who can offer a partially sensible explanation as to why the monster storms seem to be fading away, and not getting worse like every doomsday prediction suggested. It could save the 3,500 residents of the coastal city from a very costly winter, including predictions of $9-a-gallon gasoline if fuel had to be flown in. Ok, an interesting statistic. But let me skeptically point out that hurricanes 72 through 76 came in pretty rapid succession. Is 2232 days the start of a trend or just a valid outlier? So how would the graph look if the measurement were days between hurricane (i) and hurricane (i-n) with n = 2,3, or 4? So, according to you, alarmists can make wild and silly claims about increased numbers of hurricanes making landfall, but nobody can point out they are completely wrong? yes, that’s what alarmists do continually…. whenever one outlandish claim is challenged it’s time to change the focus, move the goalposts etc. whether or not hurricane landfalls is a “meaningful” measure I remember well the hype every time another hurricane hit the USA mainland (the Florida hurricanes in 2004 and Katrina in 2005 are the most recent examples)…. hype hype hype of a Chicken Little variety about how this was evidence of drastic climate change…..
Shouldn’t this count as one of the extreme events that the alarmists have predicted–an extremely long time between hurricane landfalls in the U.S.? Perhaps we can look forward to extremely pleasant weather. Oh don’t remind me here in Florida we have been paying way too high insurance rates, because a modeling firm predicted that because of global warming we would have a huge increase in hurricanes. Even if they predicted that we would have normal hurricane seasons or even a slight increase in hurricanes we would be paying a lot lower premiums. Global Extremely Pleasant Weather! It’s worse than we feared! The data on hurricanes making landfall is, of course, a sub-set of all hurricanes but one on which consistent data are available since 1851. Only since weather satellites has it been possible to track all hurricanes with a high degree of accuracy, though valaint efforts have been made use records from ships logs. Why do you think that it’s “or”? If there are 184 days each year with no hurricanes (winter), how come this is not evident in the first graph? Or am I missing something? According to http://en.wikipedia.org/wiki/List_of_United_States_hurricanes there have been quite a number of hurricanes in USA in the last 6 years. What is the catch? Why are the 1,833 confirmed deaths from Hurricane Katrina August 2005 not shown in the graph of ‘Hurricane Deaths and Death Rates 1900 – 2010’? They must never be forgotten. Every school child should be taught about them and how bad science pushes out good science if people like them are not stopped. This post is meaningless. Why aren’t you looking at the total number of hurricanes rather than the pseudo-statistic of landfalls, especially if you are trying to disprove the (falsely simplified) notion that AGW causes more hurricanes….. The post is far from meaningless; the problem is that the media-reported position (usually based on headline grabbing from pro-disaster sources) is that global warming leads to more ‘bad-things’ such as an increase in both the frequency and strength of hurricanes that then leads to greater damage to people, livestock, crops, property etc. Hurricanes that fizzle out at sea cause minuscule damage in comparison (i.e. shipping) to those that hit land and are therefore irrelevant to the topic in hand; ask any insurance company that uses projected increases in hurricane damage as a reason to up its premiums. Your use of the word ‘notion’ is an accurate one, as it implies a general perception rather than hard facts; it is the very use of such amorphous and misleading terms that the general public (of which am I proud member) gets pushed down its collective digestive tract on a frequent basis. It is therefore fair game to go after such bilious statements and show them for the bile they really are. The fact is that the media has been pushing the ‘notion’ that hurricanes are going to get worse and people living in their path are in for an ever increasingly rough ride; what a shame that real measurements, as opposed to odious models, show this to be a steaming pile of Richards. P.S. For our American cousins, Richards = Richard the third’s = You work it out. To be fair, the article looks quite balanced. The discrepancy in numbers is because they are counting all hurricanes and not just those of 3-5. Why are the 1,833 confirmed deaths from Hurricane Katrina August 2005 not shown in the graph of ‘Hurricane Deaths and Death Rates 1900 – 2010′? I checked the linked paper…it’s actually deaths per year….187 means approx 1870 for the decade and means that Katrina accounted for almost all the deaths of that decade. No need, iiii, because the alarmists will blame the lack of hurricanes on AGW. Is there evidence to the contrary? Oops… My reading skills need updating…Katrina IS the last Cat 3.. Please see the graph of total yearly cyclone/hurricane energies by year. 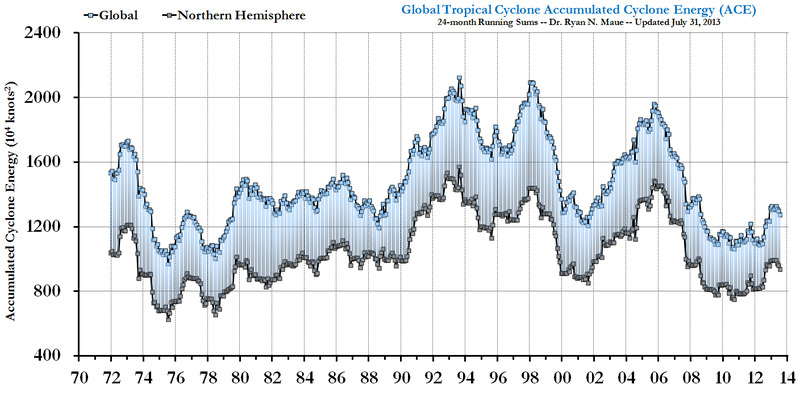 [ http://coaps.fsu.edu/~maue/tropical/global_running_ace.jpg ] We are currently at (or near) a 30-year low for this type of storm energy. 772 averaged out over 10 years…77 under the 104. Mods, or whomever: the second graph needs to be fixed to help confustion.. Anyone who lives in the Southern US (Gulf coast, Atlantic) and has been paying significantly higher insurance premiums since Katrina should print this statistic and take it to their insurance provider to ask for a premium reduction and rebate. It seems insurance modelling has given these companies windfall profits at the expense of bogus AGW alarmism. This needs to be stopped and the insurance companies involved need to be taken to task for their bogus modelling statistics. My newspaper said today we can expect a lot more cold weather due to AGW! Anthony: I dunno whether Ike was a major hurricane or not, but it sure looked big to us here in the Clear Lake area of Houston. Ruined a condominium complex that had a unit owned by yours truly. Tore up Kemah and Seabrook (mainland communities) among others. That was in 2008, only three years ago. More info: Wikipedia says Ike was a strong category 2. Sure played hell around here, though. It was a strong storm, but this article and chart are referring to CAT-3 and above storms, which Ike was not. Here in the Northeast, Irene was not even a hurricane when it crossed our coast, but the hype about what a strong storm it was and how it was proof of CAGW seemed endless. In truth, tens of thousands were without power for weeks and it was weeks before downed trees were removed and sand carted away. This “powerful storm” hype provided a great excuse for authorities to avoid explaining why they were so unprepared. If Irene had been as strong as Ike it would have devastated us. The anticipated new record being “unprecedented”, the only conclusion possible according to Climate Propaganda’s own “method” is that rising CO2 levels quell Hurricane Landfalls! I would like to ask Jerky a question and then make a few more pointss about the record of US landfalling hurricanes. According to Emanuel’s reasoning, how many hurricanes were there in the Atlantic, Caribbean and Gulf of Mexico in the year 1392? The answer is NONE. His paper, which you used to bolster your arguments, is based on the assumption that if we don’t have a record of a hurricane, it didn’t happen. Consequently, Emanuel’s logic would conclude that there were almost no hurricanes in the Atlantic, Carribean or Gulf of Mexico before 1492. I lost all faith in peer review before I finished reading the abstract to that paper; it was so fundamentally meaningless and misleading. 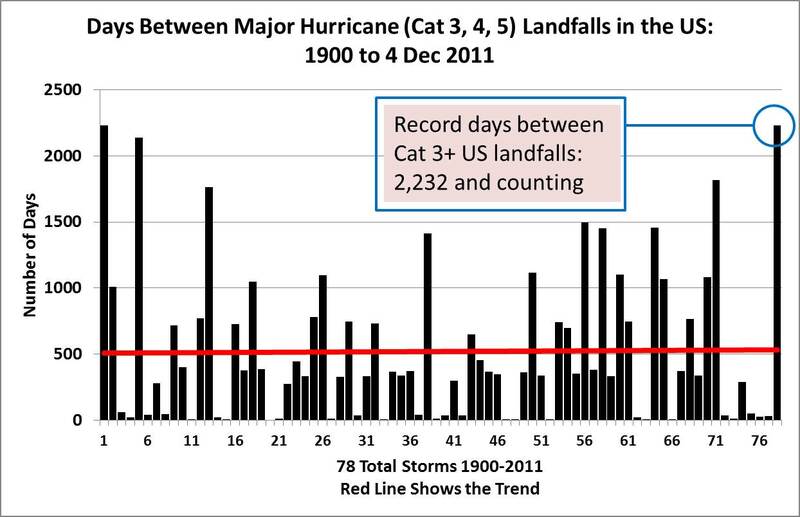 While many have commented on the integrity and accuracy of the ‘US Landfalling Record’, I would like to point out that even that record will be skewed, tending to show an increasing trend in both number and intensity of landfalling US hurricanes as a result in improving technologies. The fact that it doesn’t, is a good indication that there is actually a long-term decline in US landfalling hurricanes. Take, for example, Hurricane Wilma, the last major hurricane to hit the US mainland. If the exact same storm had hit before 1945, it is doubtful it would have been recorded as a major storm. It made landfall in Southern Collier County, FL; a place that is still very short on people and anemometers. Wilma’s intensity at landfall was determined by aircraft and Doppler radar. Surface measurements did not support category 3 strength. Now think of all the minimal hurricanes that yet the US in the last 50 years. How many of those would have been recorded as tropical storms in the 50 years prior? Certainly, this years Irene would have been one for starters. As our ability increases to detect maximum sustained winds anywhere in a tropical cyclone, there will be a general increase in the number and intensity of storms in the record books, even if there is no actual increase in nature! This is true for any tropical cyclone metric over any period of time, including landfalling US hurricanes. When scientists ignore this very simple fact, perhaps out of ignorance or an ill founded desire to promote the global warming myth, they do themselves, science and society a great disservice. Don’t want to burst anyone’s bubble but the trend since that time is that overall tropical storm/hurricane activity has increased in the past 100 years – not unexpected as a result of coming out of the LIA. Irene may or may not have been a cat 1 when it made landfall in NC , but she didn’t ruffle many feathers there . A relative of mine who lives in Wilmington – and has been through eight or nine hurricanes – said it was no big deal . Apparently the power remained on through the whole thing . According to him , pretty much everything that could be damaged by a hurricane has already been damaged and the local building codes are tough and strictly enforced . Yet , his insurance rates remain exhorbitant . Decisions decisions… the CAGW crowd COULD decide to take what has been a traditionally Skeptic stance that global warming reduced the differential in upper and lower atmosphere and therefor reduces the potential for massive hurricanes….. and then use this news as evidence of global warming. How do we compare recent tropical storm seasons to past seasons? We are able to detect more tropical storms with new technology. So now, how do we compare past storm seasons with future storm seasons. Aren’t the more recent storm season numbers inflated due to the ability to detect more storms? “Also gettting a post-storm upgrade was Tropical Storm Nate, which analysts now believe was actually a hurricane. There have been lots of storms since 2005. 2008, 2010 and 2010 and 11 have all been hyperactive storm years. However, it seems as though most of these storms went out to sea, if you look at hurricane landfall maps. We’ve just had some REALLY good luck in the USA. Our luck will change. Regarding the Deaths & Death Rates graph, please either explain it properly, replace it, or get rid of it. It is a very poor representation of the figures, and highly confusing and misleading. If ‘Deaths’ (blue bars) it is actually meant to be ‘Deaths per year BY DECADE’, then the blue bars begin to make sense. However, what on earth are the red bar figures then? I am tending to my initial take on this graph – it is bogus. Using the above definitions, Tropical Cyclone/Hurricane Katrina makes a mockery of the figures for the decade of 2000 – 2010.